Prototype: German Federal Railroad (DB) class E 41 standard design electric locomotive. Steel blue basic paint scheme. Version with 3 simple lamps, Schweiger ventilation grills with vertical fins, and continuous rain gutter. Road number E 41 012. The locomotive looks as it did around 1958. Steel blue basic paint scheme like the first 71 locomotives in the series. Model: The locomotive has a digital decoder and extensive sound functions. It also has controlled high-efficiency propulsion with a flywheel, centrally mounted. 4 axles powered by means of cardan shafts. Traction tires. The triple headlights and dual red marker lights change over with the direction of travel, will work in conventional operation, and can be controlled digitally. The headlights at Locomotive Ends 2 and 1 can be turned off separately in digital operation. When the headlights are off at both ends, the double "A" lights are on at both ends. The cabs have lighting and it can be controlled separately at both ends in digital operation. Maintenance-free warm white and red LEDs are used for the lighting. The locomotive has separately applied grab irons. The cabs have interior details. The roof walks are separately applied. The locomotive has detailed buffer beams. Brake hoses and coupler hoses that can be attached to the locomotive are included. Length over the buffers 18.0 cm / 7-1/8". 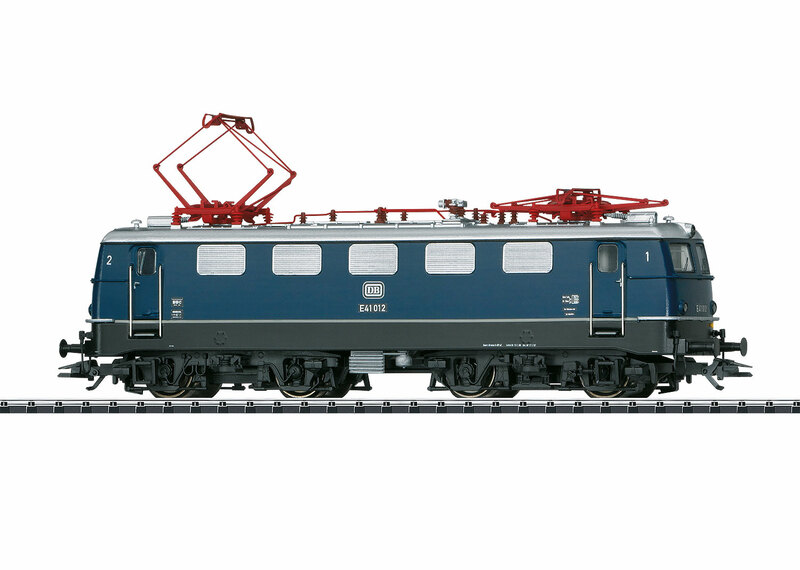 This model can be found in an AC version in the Märklin H0 assortment under item number 39415. The German Federal Railroad purchased 451 class E 41 locomotives from 1956 to 1971. They left their mark on more than just commuter service from the Alps to the coast. This successful design can be described as a general-purpose locomotive since it was motive power for just about everything in its long service life. It was soon taken out of the hard S-Bahn service because it was not suitable for such work due a lack of electric brakes. Its core job remained commuter service, principally in shuttle train operation with "Silberlinge" cars. The E 41 had no problem on electrified branch lines due its required low axle load distributed over two two-axle trucks. The oil-cooled transformer was given a relay on the low voltage side that led to a characteristic sound for the class E 41. The locomotive soon acquired its nicknames "Champagne Cork" or "Federal Railroad Fire Cracker". More than a few train passengers thought this cracking sound meant damage to the locomotive and were more or less irritated. The class E 41 (from 1968 on "141") had double-arm pantographs during its entire service life. Otherwise, its outer appearance changed due to conversions and rebuilding. It was in use in Germany from the Alps to North Germany with either three or five lamps, with or without rain gutters, with rounded or squared off vents, and in the paint schemes that change over time. The "Fire Cracker" was viewed as a proven, reliable design right up to the end of its service.